Paula Mabel Helland, age 83, went home to be with the Lord Friday, May 4, 2018 while residing at the Sheridan House in Fergus Falls MN. Mabel was born in Brooklyn NY on September 1, 1934 to Alf and Johanne (Nilsen) Benson. She was baptized in 59th Street Lutheran Brethren church in Brooklyn. Mabel attended PS 105, Pershing Junior High School and Fort Hamilton High School in Brooklyn and then attended Hillcrest Academy in Fergus Falls graduating in 1952. Mabel returned to New York after graduation where she worked at Asiel and Company in Manhattan from 1952-54. In June of 1954 Mabel and Harland were united in marriage at 59th Street Church. In the summer of 1954 they returned to Fergus Falls where she worked for the city of Fergus Falls while Harland completed seminary. In the fall of 1956 Mabel and Harland moved to Antler ND to serve Bethel Lutheran Brethren Church. In November of 1956 their son Mark was born. In 1959 they moved to Minot ND to serve Our Redeemers Lutheran Church. In December of 1959 their son Wayne was born. In the summer of 1962 they moved to Lynnwood WA to serve Maple Park Lutheran Brethren Church. In April of 1964 their daughter Joan was born. In the fall of 1968 the family moved to Bothell WA. Mabel taught piano and supported Harland in his new role as Director of Home Missions to the Church of the Lutheran Brethren until 1984. In the fall of 1973 Mabel and Harland moved to the Helland family farm on South Union Avenue, Fergus Falls MN where Mabel continued to teach piano. From 1979 to 1986 Mabel and Harland served Landstad Lutheran Church in Perley MN. 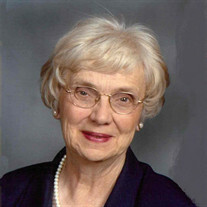 From 1984 to 1987 Mabel also served as assistant to the Alumni Director for the Lutheran Brethren Schools. In 1988 Mabel and Harland together with Wayne and Lisa started Hilltop Gardens which they ran together until 1996. From 1986 to 2002 Mabel played a supportive role to Harland as he served as chaplain at Broen Home. From 2002 to 2004 they served Sunshine Lutheran Brethren Church in Holiday FL and Desert Rose Lutheran Brethren Church in Tempe AZ. Mabel loved spending time with her children, grandchildren and great-grandchildren. She also loved the time she spent at the Sheridan House where she made many friends, enjoyed playing games and “laying puzzle”, participated in Bible studies, and played the piano for services at Broen Home. Mabel’s entire life was focused on serving her Lord by serving others. Mabel was proceeded in death by her beloved husband, Harland; her parents; sisters-in-law Carol Gunderson, Ruth Helland and Olive June Helland; brothers-in-law Lloyd Helland and Paul Seland; nephew, Timothy Gunderson; and great- niece Heidi Helland. Mabel is survived by her daughter Joan (Jim) Soholt of Minneapolis; Wayne (Lisa) Helland of Fergus Falls; Mark (Cathie) Helland of Fergus Falls; her sister Margaret Seland of Fergus Falls; sister-in-law Luella Helland of Fergus Falls; brother-in-law Norman (Pat) Gunderson of Fergus Falls; 18 grandchildren, Alex Soholt, Hannah Soholt, Katrina Soholt, Heather Randall, Shonelle (Shane) Edenloff, Shaylia Helland, Daniel (Claire) Helland, Mark (Olesia) Randall, Matthew (Emily) Helland, Timothy (Tahlia) Helland, Kristine Helland, Justin Helland, Kesheria Pollins, Darion Helland, Maurika Helland, Levi Helland, Aaliyah Helland, Jon Pontius, Meghan Gildea; eight- great grandchildren, Lillian Minge, Jacob Edenloff, Luke Pontius, Brandon Pontius, Marisol Helland, Henry Helland, Vitaliy Randall and Milana Randall along with beloved nieces and nephews.